Entourage hottie Adrian Grenier and SHFT, the green lifestyle website he founded with film producer Peter Glatzer, have teamed up with Gilt Man to curate a shop of sustainable picks, including casual apparel from Nau, eco-kicks from Simple Shoes, vegan bags from Matt & Nat, and ethically made jeans from EDUN. Running from now till 12 p.m. 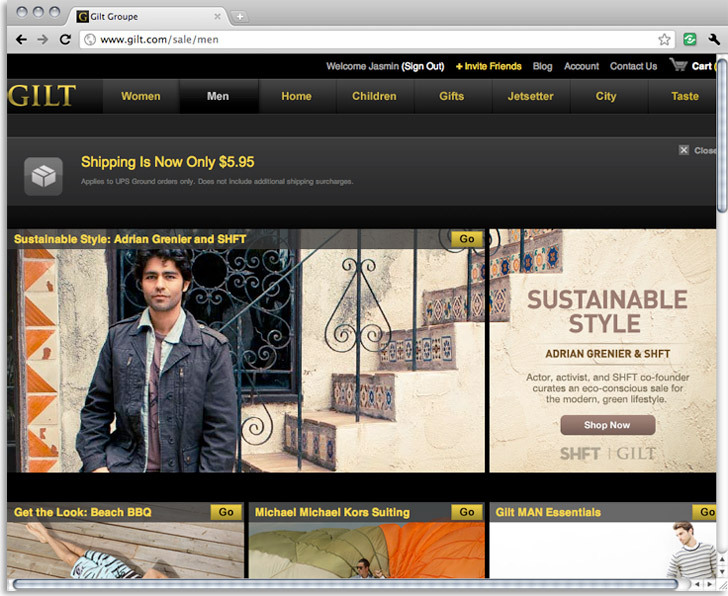 ET on June 3, the sale offers planet-pandering duds for dudes at up to 45 percent off retail price. Click below the fold for a video of Grenier discussing his collaboration with Gilt Man—and page through our slideshow for a few of our favorites. Seems like fashion for men is a bit behind on the sustainability front. I hope that Adrian's support, and continued commitment, to the being green helps more designers launch eco-friendly lines and that more men will be buying green. Entourage hottie Adrian Grenier and SHFT, the green lifestyle website he founded with film producer Peter Glatzer, have teamed up with Gilt Man to curate a shop of sustainable picks, including casual apparel from Nau, eco-kicks from Simple Shoes, vegan bags from Matt & Nat, and ethically made jeans from EDUN. Running from now till 12 p.m. ET on June 3, the sale offers planet-pandering duds for dudes at up to 45 percent off retail price. Click below the fold for a video of Grenier discussing his collaboration with Gilt Man�and page through our slideshow for a few of our favorites. Nau Cross Check shirt ($66, down from $120). Nau Urbane jacket ($159, down from $278). Nau down jacket ($174, down from $315). EDUN Slim Fit jean ($69, down from $108). Simple D-SOLVE sneakers ($29, down from $65). Matt & Nat Rowland messenger bag ($109, down from $235).